Fredericton City Hall, which was built in 1876, had suffered from cracks within its brick masonry walls. Attempts had been made to repair these over the years, but still the cracking continued to occur. In addition, the upper levels of masonry were becoming badly soiled and deteriorated due to an inadequate roof perimeter overhang, which did not drain water adequately away from the walls. The challenge was how to restore the building to a durable condition and prevent repaired cracks from continuing to re-open - without significantly changing the appearance of the building. Investigations confirmed the presence of voids within the inner core rubble of the foundation walls and it was determined this was at least contributing to destabilization of the masonry and its cracking. There had been a history of flooding from the nearby Saint John River and it seemed likely that this had caused voids to form by washing out the lime binder from within the rubble. However, it was also considered that the cracking problem was at least partly caused by the design of the window openings which - in the absence of projecting lintels - concentrated loads at the jambs. 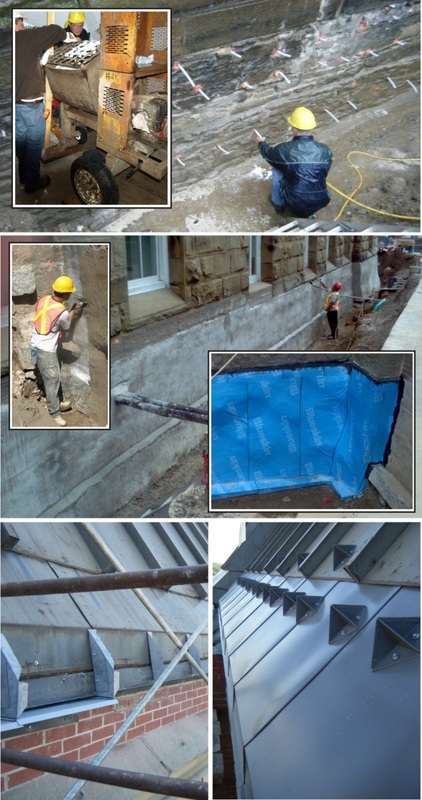 A strategy was designed which included the installation of stainless steel helical masonry ties across the masonry assembly, low pressure injection of a lightweight cellular foam grout into voids within the inner core rubble of foundation walls, and below grade waterproofing. A drainage system was also installed. Lengths of stainless steel helical rods were mortared within slots cut into brick masonry joints so that loads were transferred away from window openings. Cracks were then repaired and deteriorated joints repointed. Extensions to the roof perimeter overhang were fabricated and installed so that roof drainage water can be shed away from the upper levels of masonry.